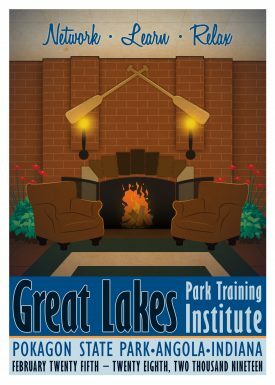 A growing need for training of professional personnel was being expressed by many park and recreation administrators from state parks, park districts, and recreation departments throughout the Midwest in the mid 1940’s. A meeting was convened in the summer of 1946 at the invitation of Dr. Garrett Eppley, newly employed faculty member at Indiana University, to discuss this stated need. Attending were representatives of state park systems in Illinois, Indiana, Michigan, Minnesota, Ohio, and Wisconsin, plus representatives of several municipalities having park and recreation departments and forest preserve districts in these same Great Lakes States. Dr. Eppley proposed an educational institute to include general sessions and detailed workshops. The group supported the idea and arranged for a pilot program to be held in late 1946. Dr. Eppley agreed to assume leadership for developing the program. Delegates totaling 116 persons attended the pilot program held at McCormicks Creek State Park in Spencer, Indiana. Considering the program a success and service to departments, the delegates heartily endorsed the continuation of the format and program, and adopted the name, “Great Lakes Park Training Institute”. The delegates recommended moving the site to Pokagon State Park, a more centrally located site to all Great Lakes States. It established a planning committee with representatives from state park systems, state and regional associations for parks and recreation, the national associations of AIPE and NRA and a select number of larger municipal districts including Chicago, Detroit, Minneapolis, Milwaukee, Cleveland, Ft. Wayne, Huron – Clinton metro Authority and others. It was determined that this planning committee would meet annually to select topics of current interest to the field and recommend speakers and workshop leaders to the program. 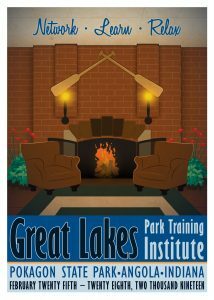 The first planning meeting followed the pilot Institute and the first Great Lakes Park Training Institute was conducted in February of 1947. The planning committee felt that continuity of dates could be attained if the dates of the Institute were kept constant from year to year. Thus dates centered on the last full five days in February, ending on the last Friday of that month. This obviously aided other conferences to schedule their respective programs and avoid conflicts. The planning committee further recommended that the goals of the Institute include a “low cost” program allowing departments to send several staff who could benefit from the educational personnel. In an effort to keep costs minimal the university initially provided space, secretarial help, phone and supply costs, and time of the director to augment delegate fees. The planning committee further decreed that persons in the field could be expected to share their expertise to avoid the costs of paying for program personnel. Thus fees were kept at a level only to pay for some costs to operate the Institute. The Institute has grown both in numbers of delegates and in its program emphasis. Over its history the Institute has reached more than 15,000 delegates. Over 700 workshops and general session topics have been provided. Nearly 2500 professionals have volunteered their time and expertise to share experiences and successes at the annual program, all at no cost to the Institute’s operations. It speaks well for this service profession to recognize the willingness of persons in parks and recreation to contribute to the growth of others in the field. The cost to delegates is minimal, the need for sharing of experiences is being fulfilled, and the cooperative efforts among park and recreation departments and the University is evidence of a successful venture. Indiana University thanks the sponsoring agencies and their representatives for their planning and direction of the Institute and appreciates the contributions of program persons who appear at no expense to the Institute. The Institute has all the ingredients to continue to provide a quality program serving park and recreation agencies.